This page documents astrophotography comments, tips, and photos. Contributions welcome. Be certain to see the other articles on the main Astrophotography page. impressive collection of adapters I might add. try to use it with my scope. I must be missing something. camera with the telescope. I take the photo but everything is blurred. item. How do the rest of you C-3000 owners deal with astrophotography?? Mike here: Some thoughts: Use a low power eyepiece with the Digi-T and focus it to your eye. Then attach the camera to the Digi-T. Center a bright object, like the Moon or some terrestrial object. If you can disable auto-focus, do so. If not, focus for infinity. The image should be in focus on the LCD screen. Next, to avoid blurring from hand-induced vibrations, use the self-timer. Try automatic exposure first (since it is a bright object). Once you have these techniques down you can move to fainter objects with longer exposure times. Subject:	Do I need a drive corrector? the JMI Piggyback Camera Mount that I read about on your site. based mostly on the positive reviews from your site. there are plenty of us out there! Mike here: The ETX-90EC with or without the Autostar has dual-axis control but it will require manual drive corrections during tracking. That's where a guide eyepiece helps. However, since you are using the eyepiece you can't take photos through the eyepiece without some additional equipment. But for piggyback astrophotography this setup works fine. Remember to polar mount the ETX. If you add an off-axis guider attachment you can guide and do photography through the telescope at the same time but I've not tried one with the ETX. the scope (I have an ETX70) has to be in polar alignment. Mike here: When a telescope is NOT polar mounted, the sky will rotate in the field of view of the eyepiece or camera. This is due to the movement of the telescope in two directions (altitude and azimuth) versus one (Right Ascension). For very short duration photos this is not a problem but for longer ones trailing will occur. your website - keep up the good work, it's an encouragement to us all. have to give that a go as well. my pics to. Attached is a JPEG of a index print of some lunar pictures. Fuji. Any help will be greatly appreciated. Mike here: I really need to know more about how you are taking the exposures before I can give a good answer. However, some thoughts come to mind. You mention you are changing eyepieces in a dark room. Why? Are you leaving the shutter open while you change eyepieces? If so, that leads to a possible cause: inconsistent exposure times from one exposure to the next (or stray light or both). You don't mention the camera you are using but if it is an automatic exposure camera then sometimes it will get the "meter reading" right and sometimes it will get it wrong. This is due to the "hot spot" location where it gets its main reading. If the Moon is in the hot spot, fine. If black sky is in the hot spot, oops -- overexposure. But even if reading the Moon, you may still get an over or underexposure depending upon the phase, film, shutter speed capabilities. Lastly, you should always have one or two (I prefer two) daylight shots at the beginning and ending of the film strip. That allows the lab (or machine) to better calibrate the exposure AND to avoid cutting frames in the middle. Mike here: I like PhotoCD, which is higher quality than JPEG on CD-ROM. It is also more expensive. But that won't change the processing or exposure problems. website (thank you for your website - it's wonderful)  and he loves it. He's even corresponded with you a few times regarding accessories etc..
out every night for the past few weeks since the sky's are so clear. Scoptronics has the adapters for digital cameras, I am thrilled. specifically look for since this will be used on the telescope? my bases covered when it comes to the telescope. Thank you so much. I'm sending this from my work e-mail address so he won't find out. Mike here: Almost any digital camera can take good pictures through a telescope. If you want to attach it using the Scopetronix Digi-T System you will need a camera that is supported by the Digi-T (i.e., has adapters). Another consideration is degree of control over the exposure. For objects like the Moon, fully automatic exposure is likely OK but for fainter objects you will need to control the exposure manually. Some cameras even allow exposures of up to 8 or perhaps 60 seconds. And don't forget a self-timer feature; you need that to allow vibrations to dampen out after pressing the shutter button. I thought this site might interest you as he uses the Coolpix 995. Check out the tips and gallery sections. digital camera imaging. Hope this link works better. Subject:	Trick to focusing camera? see a single white blurry disk and 3 blurry dots to the sides (moons). good source for figuring this out? Thanks for your help! Mike here: Yes, that is one of the challenges of SLR astrophotography. However, there is a neat item that can be purchased or homemade. See the "Focus Aid" article on the Telescope Tech Tips page. last round I experimented with exposure times on Jupiter and Saturn. but -not- a lens in the camera. image on an (unlensed) external film plane. Otherwise choose the brightest target possible (like Sirius). Mike here: That's real "eyepiece projection photography". Eyepiece + camera lens = afocal photography. where i could find what I am looking for. Mike here: Are you talking about a 0.965 to 1.25 inch eyepiece adapter? Mike here: OK. It sounds like you are referring to a T-Mount ring. There are specific ones for each camera lens mounting design (bayonet or screw). Your local camera dealer should be able to help you. Scopetronix, I shot the attached photo of yesterday's solar eclipse. the filter of course, with no problem. Any ideas? Mike here: Looks like an internal reflection. I suspect it is coming from the inside surface of the solar filter. Can you vary the spacing between the filter and the telescope lens? do some experimenting though. I'll keep you posted. distance of the filter from the objective must be only one factor. Thanks again Mike for the great web site! Mike here: You are correct that exposure level influences what is captured on film. And your earlier comment about the varying distance is what keyed me to it being a reflection. As you move the scope side to side (or up/down), the angle of entrance of the Sun's image changes and so does the angle of reflection. such a thing, or is it preferrable to buy the Meade electronic eyepiece? I read that it has 76k pixels, my Sony has something like 320k pixels. Mike here: Simplest is placing the camera on a tripod and pointing it at the eyepiece. Next simplest (and better) is either the Universal Digital Camera Adapter or the Digi-T from Scopetronix. You may or may not be able to use the Digi-T. For other adapters see the Accessory Reviews - Astrophotography page. I have no experience with the Meade Electronic Eyepiece so can't comment on that. if it was an asl and not digital?? Mike here: Yep, I also use a 35mm film SLR camera as well as a digital camera. See the "Original Astrophotography - Basics" page (linked from the Astrophotography page) for more on 35mm film to digital. me that wide shot since the 26mm does not and show big time vignetting. Mike here: There are a couple of factors at work here. The distance between the eyepiece and the camera lens will affect both the size of the image and the amount of vignetting. If you digital camera has a zoom or macro capability, try that. With my Ricoh I could not zoom enough to capture a full moon image but could with a wide field adapter and 40mm lens. Vignetting refers to the image not filling up the entire field. Mike here: A long time ago I used to develop my own film but I stopped (no time). I then used standard photo processing (not the 1 hour variety). Today I use PhotoCD processing. I know that others use 1 hour and pictures-on-disk. back mount or a meade one? Mike here: Piggyback astrophotography is the second easiest way to get started in night sky photography (the first is to just point the camera at the sky and leave the shutter open for several minutes or hours; you get nice star trails and star colors that way). I don't think Meade offers a piggyback adapter. But I assume you are looking for what it means in relationship to photography. The numbers that follow it are measures of film speed; the higher the number, the "faster" the film (meaning that less light will yield more results). I tried to email one of the people who posted here about a cheap CCD. has written software for it free. star trails so the pictures can be stacked. lots of pictures here. that I may consider buying? still one that uses standard types of films'? gained much from your wisdom and your experience. Thank you Clay and have a nice Wednesday. up out of the way as well, aiding in vibration reduction. beat the Scopetronix piggyback adapter. Mike here: Thanks. The other problem with digital cameras for piggyback astrophotography that most will only allow exposures upon one or a few minutes. For short duration photos of less than a second or a few seconds, they work well. So, for planetary and some brighter deep sky objects, digital cameras can work. See the Astrophotography page and the Astrophotography galleries. Excellent point.....one which I totally overlooked! hangout and try to read the related articles there. Best of luck...you will really enjoy that piggyback mount. Subject:	RE: Meade ETX for Planetary Astrophotograpy? have some questions for you, if you have the time to answer. need to buy a better tripod? Subject: Re: Meade ETX for Planetary Astrophotograpy? > Are the ETX's good for Planetary Astrophotograpy? See the Astrophotography Galleries on my ETX Site. Mike here: The new #884 is more sturdy than the #883. So is the #887. I don't have either however. Mike here: It will pick up colors. Whether they are proper or not depends upon the film (or imager) sensitivity to various frequencies and (with film) whether it suffers from color shifting with longer exposures. Mike here: There are a couple of factors at work here. First, by zooming in you are magnifying the motion and so what motion doesn't appear at the lower magnification can appear at the higher magnification. This means that you need to address the root cause of the trailing so that regardless of the magnification, no trailing is evident. HOWEVER, doing that requires a lot of patience and work. So, you must precisely polar mount and align your telescope (trailing can't be overcome in Alt/Az mounting without adding a field derotator device). You might want to see the "Getting Started in Astrophotography" article (linked from the Astrophotography page). Thanks Mike for your quick response and suggestions for the problems. You have an excellent Web Site here! would be better if I could see what astrophotographers think of them. Mike here: The only info available is what is there in the user comments about the cameras. It would be nice to have a comparison of several different models but that would require that someone have several different current popular models. Mike here: Film and digital imagers are more sensitive than the eye and can "store" information better than the eye. Plus you can "stack" photos (overlapping, essentially) to add up the data on the film/image to improve the picture. And yes, long exposures can have "image trailing" unless you manually guide the telescope during exposure. This works best with piggyback astrophotography the camera is mounted on the telescope tube and takes the picture through its lens while the telescope tracks the sky (manually assisted by the user at the eyepiece). For more information on astrophotography, see the Astrophotography page. Mike here: Yes, this is a possibility. You can reduce the chance of a problem by rotating the camera body to be parallel to the telescope tube. This should let it avoid the forks when the telescope slews to high altitudes. portable power) this can do several things. All of these scenarios are a bad thing, So "think" before you "do"!. bigger and better pictures than the etx90? Mike here: I have used both my ETX-90RA and the ETX-125EC. You can get brighter images and more magnification with the larger aperture. Thanks and again....a GREAT site!! Mike here: I have no experience or familiarity with this camera. Normally, to mount 35mm removable lens cameras (if that is what it is) you remove the lens, attach a T-Mount ring which is specific for certain camera models. That ring then attaches to the camera adapter, which attaches to the telescope. You can see these adapters discussed in more detail on the Accessory Reviews - Astrophotography page. As to the Barlow being included, I don't think there is any included with the ETX-70AT but if you got a 3X, use it. in case you want to list it in your links. Great site! Thanks so much for keeping it so current. 1. The Minolta D7 - I have the same setup that Joe Kazup wrote about. shutter button on the camera, which does wonders for in(stability). What is prime focus good for? Bad for? 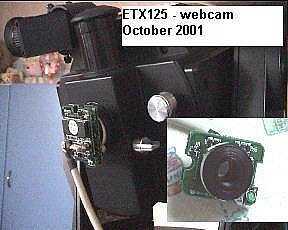 What about CCD imagers for the ETX (e.g. SAC-7)? Thanks for your help and for the great site. Mike here: Well, the good news is that you can do astrophotography with the ETX. And the bad news is that you can't do astrophotography with the ETX. Hope that clears things up... The real story is that you can do some kinds of ETX astrophotography on some objects with some equipment. There are many examples of ETX astrophotography on my ETX Site; some poor, some good, and some really amazing. All it takes is patience, luck, and some effort. But that's true no matter what telescope you use. Astrophotography of brighter DSOs can be done with the ETX models, given the above constraints. Again, there are many examples on the ETX Site. As to the Meade vs Celestron LPR, I have only the Celestron one and it works for me. I appreciate very much the time you put into your reply...I am grateful. long-exposure astrophotography. Right so far? to correct whatever tracking errors there may be. presumes the above is fairly accurate. that allow the connection of SCT accessories to ETX-90 and -125 models. Mike here: Well, you are essentially correct. The ETX can do astrophotography of all types, as can be seen on my ETX Site. And there are probably off-axis guiders that will work (you'd need one of the SCT adapters also). But the drive system is not designed (nor priced) to accommodate the minute corrections needed for accurate guiding at large magnifications. I've guided for piggyback photography (examples on the Site) using an illuminated reticle eyepiece but the image scale on the film is very small. minute corrections needed for accurate guiding at large magnifications." Thanks once again for your great advice. Mike here: The drives were not designed with astrophotography in mind since these telescopes were not intended to be used for astrophotography. The fact that the telescopes CAN BE USED to take some amazing photos is what counts. If you want a system designed for astrophotography, you'll need to spend more money. like a good product and will help with imaging. this give me much advantage in terms of FOV over my 26mm. Mike here: I have been planning to try the Digi-T on the Scopetronix 40mm but just haven't gotten around to it. But the long eye relief could be a problem. I just read your article on Mike Weasner's site on ETX Astrophotography. gotten my life's goal out of the way, let me get to the point. digital camera would yield the same or better results than the 35mm? but it will be an expensive lesson to learn. 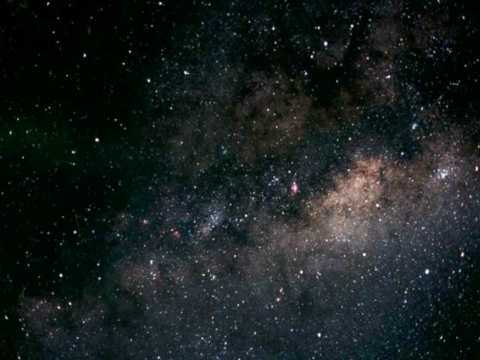 Mike here: Take a look at the Helpful Information-->Astrophotography. You'll see all kinds of examples and comments about 35mm and digital camera astrophotography. I took some neat photos last night using my Nikon Coolpix 995 that I'll be posting soon. Newtonian or any other astro photography applications? Mike here: As you can see from the photos posted on my ETX web site (in the Helpful Information --> Astrophotography and Astrophotography Galleries), CCDs, digital cameras, and video cameras can be used to make some amazing photos. Subject:	First scope for astrophotography? such as deep sky photography. It's strictly a hobby. IIe. In your opinion, is the ETX-90 a good system to begin with? Mike here: As you can tell from all the evidence on my ETX Site, the ETX-90 makes a fine first instrument. I'm not familiar with the Canon camera but yes, too much weight at the rear of the ETX will cause drive and axis slippage. You could make a counterweight system to offset the weight. Mike here: Seconds, except for piggyback astrophotography. talking only a few seconds, so 4-5 secs., or longer, like 30-45 secs. For piggy back exposures, how long can I go? Mike here: Seconds, <10 for best results, and probably shorter. For piggyback, hours if you manually correct the tracking, 30 minutes or more unguided (but tracking with a good polar alignment) when using a wide angle or normal lens. usual bells and whistles to take astrophotography pictures. Mike here: Are the star images trailed in curved lines or just squiggly lines? Curved lines would indicate an imprecise polar alignment. Squiggly lines would be from drive tracking errors. 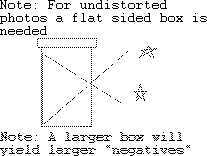 And imprecise polar alignment can come from not putting the alignment stars (assuming a two star align) in EXACTLY the same place in the eyepiece field-of-view. Also, you would need a very precise location (not just a nearby city) in your Autostar. exact location everytime I take a shot.....Is there another way? Mike here: Your position on the Earth is important for the alignment process to be real accurate. If your latitude is different than the one listed for the City you input you should input your exact location. However, some difference is acceptable depending upon the length of the exposure. But why not go for 100% accuracy on this entry. As to centering the stars in the same way, you can use a high magnification or even center with the star image out of focus and hence larger. Alternatively you can purchase an illuminated reticle eyepiece (see the Accessory Reviews - Eyepieces page). to use this setup to shoot comets. Mike here: You should be OK however you will get "field rotation" in your photographs unless you mount the telescope in polar mode. For short exposures or short lens focal lengths you may not notice it but with the 135mm lens and exposures of several minutes you will. You may also need to use a counterweight to keep things in balance. Mike here: Doubtful. The drives are not as precise as your LX200 systems, nor is there a Periodic Error Correction mode. That doesn't mean you can not use the CCD with the ETX-70AT, it just means you'll have to keep the exposures short. Once again, thanks; you've produced a great web site. Mike here: Keith's Image Stacker is a Mac OS program for automatically stacking images and making other refinements. I have yet to try it out (been fogged in) but will report on it once I have a chance to use it. wouldn't be a problem. Thanking you in advance for all of your help. Mike here: Personally, I don't have any of these cameras. For starters, I suggest you take a look at the Canon and Minolta pages on the Helpful Information --> Astrophotography page and then look at the Accessory Reviews - Astrophotography for info on adapters. article on the Sky and Tel. website about it, and a link to "Astrovid"
for those who want a camera specifically devoted to this kind of use. Do you or anybody else have any thoughts or recommendations about this. Mike here: Take a look at the Astrophotography Galleries and the Helpful Information --> Astrophotography pages; you'll find several examples of digital video astrophotography with the ETX telescopes. enough for the link to Dr. Clay. about your brother. That was a very loving, kind thing you did. refers to a "stacked image". What's that? Mike here: Stacking images is a technique (manual or automated by software) to overlay images, thereby reducing noise in the final image and increasing contrast and bringing out details that might not otherwise be evident. Whatever information you have would be great. Thanks for your help and the great site! Mike here: I have the Nikon Coolpix 995 and really like it for astrophotography and general use as well. See the Helpful Information-->Astrophotography section for examples and tips on various models of digital (and film) cameras. I would like to try piggybacking as well. introduction to the ETX125EC *SO* very much easier! Mike here: The commercial piggyback adapters are a solid metal collar that slips over the telescope tube. It looks like there were be room just ahead of the Telrad. You would probably have to mount the camera a little to the left side to avoid the Telrad. Alternatively you could make your own; see the examples on the Helpful Information --> Astrophotography page. run into the following problems. camera viewfinder is much to dark to discern the image. camera to the T ring? Mike here: You are correct that focusing is a challenge. When doing prime focus photography (no camera lens nor eyepiece) the telescope acts like a telephoto lens, in the case of the ETX-90 you have a 1250mm telephoto. You can make a "focus aid" as discussed on the Telescope Tech Tips page which will help. In afocal photography, where the both the camera lens and eyepiece are used, you focus the camera lens to infinity and the eyepiece to your eye (assuming correct vision). Then mount the camera and shoot. The image will be in focus. If you are doing eyepiece projection photography (eyepiece but no camera lens) then you have the same problem as with prime focus photography. Keep in mind that you have to keep exposures short and avoid vibrations enduced by the camera's flip mirror and shutter movement. Use the "hat trick" method. equatorial mount designed for the etx 90). does the 90 body use the tripod block to connect to its mount. Mike here: Well, it is not quite that simple to remove the OTA (optical tube assembly) from the fork mount; there are fours hex screws that have to be removed and then you can remove the tube. Also, there is no camera tripod screw on the top of the base that you can attach a camera to. BUT, a better way to do this is to purchase a piggyback camera adapter. See the Accessory Reviews - Showcase Products page for a couple of reviews. there any solution to this? Mike here: Add a counterweight to re-balance the system. You can make one or buy something that will work. site. It's been informative and helpful. Great Site! this setup over the adapter connecting to the back of the telescope? wanted (including a one hour trip) or keep the setup I currently have? Mike here: As long as you can focus you can still shoot through the top port. I suspect the adapter you have may also accept eyepieces for eyepiece projection photography. 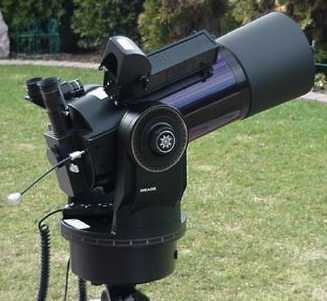 This summer I will try to go to my friends house and use his telescope. Mike here: Pinhole cameras do work. Image quality will be low but it will be interesting to see what kind of sky photography you can do. not get the camera to take photos when connected to the telescope. Mike here: If your camera has a removable lens, is a SLR camera, and you have it mounted at the rear port, then you focus the image on the camera's viewscreen using the ETX focus knob. If the camera does not have a removable lens, then you must do "afocal photography" which means you shoot the image seen in the eyepiece. In this case, you focus the eyepiece to your eye (assuming you have normal vision) and the camera lens to infinity. For more on photography, you find lots of tips and info on the Helpful Information-->Astrophotography page. how to correct whatever it is that I'm doing wrong? Thanks. I think you have a GREAT site. Mike here: The blur could be due to one of two problems (or both, actually). Is the image in focus? if not, then you have to focus the image on the camera viewscreen. Second, and probably more likely, is blurring due to movement of the telescope during the exposure. When the SLR mirror flips up and the focal plane shutter curtain moves, they create some vibration, which is tremendously magnified by the telescope. So, unless you are using very short exposures (1/125 or shorter) you will likely be getting this vibration blurring. The solution for longer exposures is to use the "hat trick" method; hold a dark object (like a "hat" or other solid object) in front of the telescope objective, trip the camera shutter and keep it open (using the "B" setting), wait a few seconds for any vibrations to dampen out, flip the "hat" out of the way for the duration of the exposure (you can get 1/2 or 1/4 exposures this way or longer as well), and then with the hat covering the objective, release the shutter. Mike here: See the Helpful Information --> Astrophotography page on my ETX web site. Lots of general info and links there. trying to use the Digi-T with an eyepiece and an Olympus camera. Mike here: I don't recall seeing one. The problem is that most (consumer) digital cameras have fixed lens. For prime photography the telescope becomes the lens, so the camera lens is removed. T-Adapter to attach the camera directly behind the ETX90/EC? of. What camera would you suggest? Mike here: Actually, for prime focus photography, the cheaper (read "older") the better. You want a camera capable of removing the lens, full manual shutter control, ideally it would have a mirror lockup feature, and it must accept a shutter release cable. Check your local camera store for a used Pentax, Olympus, Nikon, etc, 35mm SLR. for the kind of photos I am wishing to take? Mike here: I use a 1968 vintage (I'm the original owner) Pentax Spotmatic SLR. And you can see the type of photos it can do by looking at the Astrophotography pages. But I tend to use my Nikon Coolpix 995 digital camera more often now. the stars during long pose shots. I guess I need a reticlated ocular ? pose photos with the ETX 125 ? Thank you for your answers. Great Site Mike ! Mike here: The best long duration astrophotography you can do with the ETX is done by piggybacking the camera on the telescope tube. The camera shoots the sky while the telescope provides the tracking. You can adjust the tracking using a high power eyepiece (with or without an illuminated reticle). There are two reviews of reticle eyepieces on the Accessory Reviews - Eyepieces page (Rigel Systems PulsGuide and Celestron Guide Eyepiece). if you want to do long duration astrophotography THROUGH the telescope then you will need an off-axis guider accessory (no reviews on the Site). what the threading is on the port itself. Is this worth pursuing? Mike here: I haven't seen any rear port connectors for digital cameras. Remember, for prime focus photography you have to remove the camera lens and most consumer digital cameras today do not have that capability. Mike here: You want your eyes to be able to focus to infinity. So the distance glasses would be the one to wear. In December there will be a TSE visible in Southern Australia just before the sunsets. I hope to be there for my first TSE. month. It's going with me to Aus. and I hope to get some good pictures. witness only a handful more. So I don't want to fluff it. keen to use my Olympus 10X Zoom digital 2100. Maybe I could use both. any tricks how to change filters quickly? I would be pleased if people with experience could advise. Mike here: Sky&Telescope usually has some photography tips posted before eclipses (and may still have the last one online). You will likely not even use your telescope (except maybe for partial phases or close ups of prominences during totality). You'll need a solar filter for the camera (and/or telescope) for the partial phases (see the Accessory Reviews - Filters page). For totality no filter is used. Bracketing the exposures (especially with film) is a good idea. 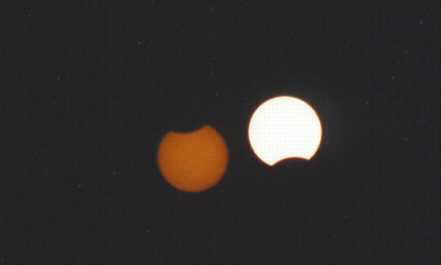 Experiment a month or two before the eclipse. Thanks for the tips. Do you have any to ensure the skies are clear? Go to the next Astrophotography - Tips page.